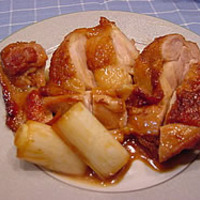 Marinate the chicken in the mixture for 30 minutes in the refrigerator. First, fry the SKIN side of the chicken (very important for crispy skin!) on medium heat until the skin is browned. I cooked this for my kids tonight and it was a big hit; the kids ate their chicken and kept saying "yum". Thanks so much for sharing! Love this simple and tasty classic. We use a whole chicken cut in half, then cook over a hot BBQ skin side up first, then turning after about 10 minutes. This is a perfect summer treat. Good with Edamame and Kim Chee. Wow! I never knew it was so simple. The only think I'm missing is the sake. Thanks! i will try this recipe tomorrow! I cooked this last night! Tasted great!! Easy and quick to make!! Since I already had pre-prepared Teriyaki sauce, I used it instead of recipe listed. I served it with steamed rice and pork dumplings. This looks good. I'm not a teriyaki fan but i could give this a try and see how tasty.